The second house from the left on the bottom right is Wally's house, if you visit him, his aunt and his uncle, you can learn that their daughter is in the tunnel because her boyfriend is the man you found on the opposite side of the tunnel who said he was digging by himself. In Emerald after you visit Wally he will call you and register you on match call. 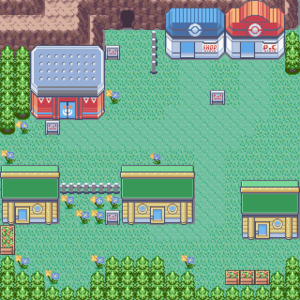 Check out this side of Pokémon Ruby and Sapphire/Rusturf Tunnel, sadly you cant bring the two lovers together until after you beat the 3rd Gym(Gym Leader Watson). If you talk to the lady in the house first from the left you'll be able to get the mood rated for your lead Pokémon. In Emerald you are not able to join contests until you reach Pokémon Ruby and Sapphire/Lilycove City, instead you get the battle tents, which are fairly fun if you know your type match-ups and you have a little bit of luck. This page was last edited on 30 November 2018, at 02:39. This page has been accessed 142,655 times.